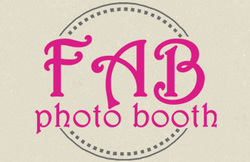 The FAB Photobooth is a portable photo booth that offers a unique and entertaining experience. We are an ideal addition to any special occasion. Delivering exceptional customized mementos within seconds, we will surely create a FABulous experience for you and your guests to last a lifetime! We appreciate all our clients who make our family business possible. We have reviews on our Facebook Page, WeddingWire and Yelp. Our clients' satisfaction is our top priority and we take your feedback to heart. Thank you for your continued support!